The Adventure Journal has published an interesting little top ten list today, giving us their picks for the ten deadliest mountains. Their selections range from the Alps to the Himalaya and beyond. In once case, way beyond. I'm sure the list was created to spur discussion and debate but I can't help but feel some of their choices are a bit controversial. It is hard to argue with K2 and Annapurna making the list, and anyone who follows the mountaineering world will probably expect them to be there. Both are incredibly challenging to climb and have proven extremely deadly over the years. For me personally, they are numbers 1 and 1A. But AJ doesn't even have either of them listed as the deadliest mountain on the planet. 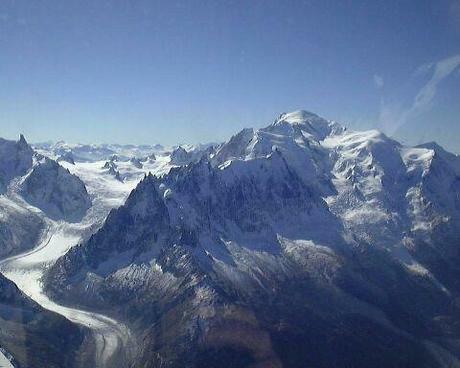 They bestow the top spot on their list to Mont Blanc, which has had an estimated 6000-8000 deaths over the years. That's an incredible stat, which is partly inflated due to the sheer number of people who climb it every year. It is estimated that more than 30,000 attempt the European peak on an annual basis, which puts a lot more climbers on its slopes that most of the other mountains on the list. With that massive number of climbers on its slopes, the relatively few that die each year is quite small, percentage wise, than those on some of the more deadly 8000 meter mountains. Some of the other selections will likely come as surprises as well. For instance Kilauea in Hawaii is listed as the Most Dangerous Volcano in America and it seems that it earned a spot on the AJ list because it has killed numerous people over the years, mostly through eruptions. Of course, that doesn't diminish the fact that it is indeed a potentially deadly mountain, but that seems to be an altogether different category than those peaks that are being examined for their challenge to climbers. The last mountain on the list is definitely one that is open for speculation. Coming in at number ten is Mount Olympus on Mars, which is estimated to be roughly 21km (14 miles) in height – perhaps the tallest in the entire solar system. That is of course an astounding size, although it has rather gentle slopes and is believed to not be particularly challenging from a technical standpoint. Of course, anyone who attempted to climb it would have to deal with all kinds of atmospheric challenges, but provided your equipment doesn't fail, it's possible that Olympus isn't even the most challenging peak on Mars. And no matter which ones you climb, provided you could actually get to Mars, you'd still have to deal with those same atmospheric issues. So, what do you think of the Adventure Journal list? Good? Bad? What should be added in your opinion?